There’s a touch of the Alice in Wonderland as we arrive at the little white door in a splendid Chelsea townhouse. No sign. No knowledge of what is to come. A healthy dose of imagination mixed in with a squirt of wonder. The culinary prowess of Mumbai born Vineet Bhatia, much heralded by Michelin and media veteran, is truly remarkable. Bhatia is a pint-sized whizz-kid. He is both hugely charming and jolly, gently gliding over to meet my companion and I towards the middle of our meal, genuinely excited to hear of our enthusiasm for his unique concept. Vineet’s wife and partner-in-crime, Rashima, is also heavily involved in operations, arriving in the U.K. with her husband in the early nineties possessing the dream of launching a restaurant. When I say restaurant, I actually mean awe-inspiringly wondrous adventure heaven, because this place – and the eight other ventures they have on the go - is seriously incredible. One might describe it as a sort of private dining club. We’re welcomed and seated in a small but comfortable circular banquette, from which we can view the elegantly decorated dining room – no larger than your average living room – which is blessed with gorgeous high ceilings, detailed cornicing and a cute bar in the middle. Our lovely waitress presents the Vineet Bhatia concept to us in a formal but affable fashion, which in a nutshell is a 10-course tasting menu of immense creativity – an explosion of well-matched flavours. Soon, we’re given our first dish; a cool lime soup with chunks of smoked prawn chaat and Amritsari haddock, a gigantic sticky prawn enclosed in a sort of glass-topped ramekin which, when opened, billows a moody smoke. This light smokeyness emitted from the prawns offsets the punchy haddock perfectly. This is next level theatrical cooking. Next up is a beetroot foie gras. These ingredients work so well together; a delicious and thoughtful pairing. Chilli cod, generous in size and glossy, is presented on a half-smashed plate. Effortlessly cool, reassuringly scrumptious. At fist glance, the duck korma appears heavy. Not so. This delicate and creamy meat has been smothered lovingly in a super-mild sauce. Fresh, brilliant. 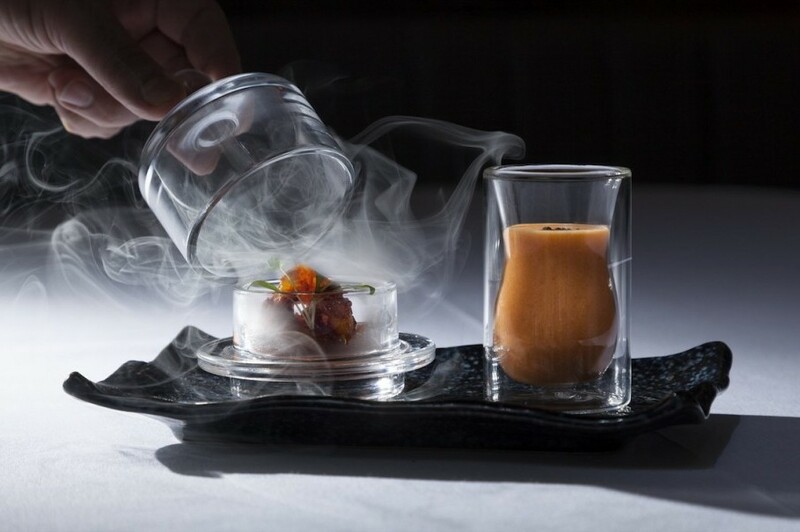 Two more courses arrive, each clearly described and thoughtfully presented in Bhatia’s distinctive modern style. We end our meal with a meriment of six tiny sweets. The Chai fudge is my favourite - the tasting menu is offered on its own or with a thoughtfully chosen wine pairing. Right, take all you know about traditional Indian cuisine, shake it up, inject it with love, and you are one quarter of the way to Vineet Bhatia London. I am not often completely blown away by every aspect of a dining experience, but I am here, and I beg you to pop along to this place at least once – soon – to be entwined in its fairytale web, too. Just make sure you pop upstairs to the private dining rooms; these spaces are seriously cool and the place to be for a birthday or special occasion.